The kitchen isn’t just a place to cook and eat. It is the place to gather, entertain and relax. Providing a space for so many different tasks makes the kitchen the prime spot for pileups. So how can you make sure your kitchen doesn’t turn into your home’s main disaster area? Here are a few tips for keeping this household centerpiece looking great all of the time. The absolute best way to keep your kitchen neat and today is to make sure that it works for you. Layout is the #1 cause of kitchen messes. Without the proper space to get things done, your kitchen can quickly become overrun with life’s necessities. When choosing your Hannover Grand Apartment in Sandy Springs, be sure to choose one which offers the kitchen layout that will work best for you. Whether you are choosing the galley style of our one-bedroom Allen or Morgan apartment, or a more spacious layout of our three-bedroom Heritage apartment, make sure the layout is what you’re looking for. What matter is that the layout and design fits your lifestyle. Nothing makes a kitchen look messy than a sink-full of dirty dishes. You can avoid this messy look by utilizing the dishwasher in your Hannover Grand apartment at Sandy Springs. By running and emptying it before bed each night, you will have a place to put those dirty dishes throughout the day. Wiping down the fronts of all appliances. Storing small appliances in the cupboards to cut down on clutter. It is easy to put off bigger kitchen cleaning duties until another day. Unfortunately, doing so will result in a messy looking room that takes more energy to clean and organize than it should. A better strategy is to choose one chore to do each day (like wiping molding, cleaning a drawer, etc.). By doing so you will accomplish about 30 extra tasks each month. 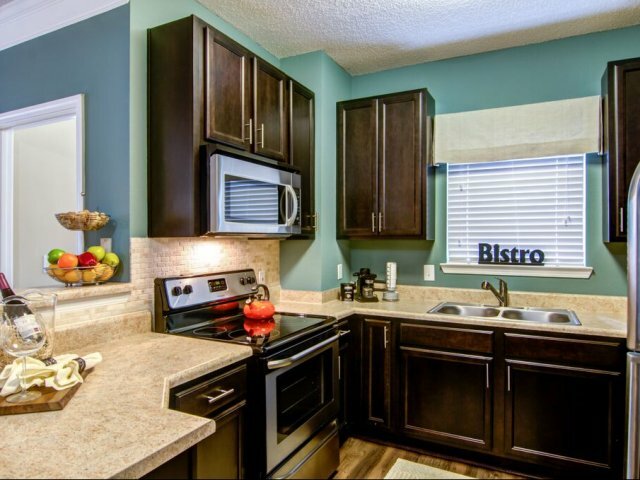 Your perfect kitchen awaits at Hannover Grand apartments at Sandy Springs. Check out their apartments layouts today!